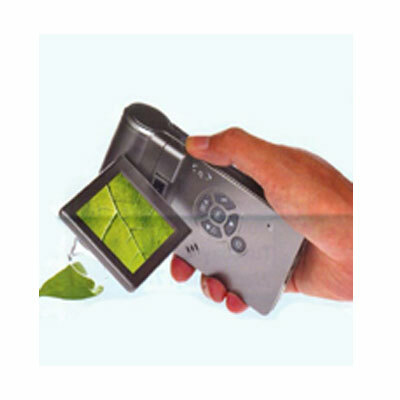 This Portable LCD Digital Microscope operates as a kind of a magnifying glass. This instrument will help you to see even the smallest material clearly, that saves your lot of time and makes your work easier. It comes with a large LCD display to see in the better manner. India Tools & Instruments Co. is known as the topmost Portable LCD Digital Microscope Manufacturers, because of their quality and high sustainable products. This Digital Microscope is portable and can be used easily. We serve lab-tested products to avoid any types of errors. Our team ensures the quality to maintain the high standards of our company. Being the best manufacturers of Digital LCD Microscope and Portable Digital Microscope we make sure to deliver the product that shows accurate results. Our product range is wide, as we offer many products according to various industrial needs. The 3" Handheld LCD Digital Microscope is a fantastic microscope that provides a good way for you to have microscopic observation on the go. The 3" quality LCD panel brings vivid crystal image. Equipped with professional microscopic lens, it helps you to see tiny objects easily. With 250x optical and 4x digital zoom, the magnification can be up to 1OOOx.800mAh rechargeable liion battery provides a 3.5-4 hours standalone working time. The 8 bright LEOs, with brightness adjustable, is bright enough for perfect observation. More exciting is the professional measurement software can help to measure size as small as 0.001 mm, which is extremely helpful to your scientific researches. With this microscope, you can enjoy your researches anytime and anywhere.